The 14th European Peritoneal Dialysis Meeting will take place in Cankarjev dom – Cultural and Congress Centre Ljubljana. 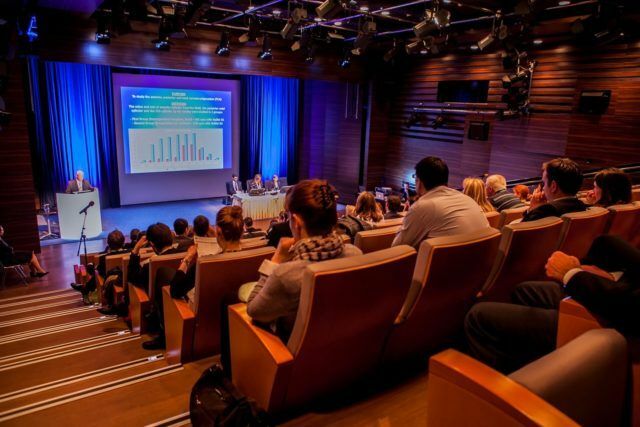 In the first weekend of May 2019, more than 400 delegates are expected to arrive in Ljubljana to attend the 14th EuroPD (European Peritoneal Dialysis) Meeting. From the 3rd to the 5th of May, the meeting that is organised and held in association of ISPD (International Society of Peritoneal Dialysis) and Slovenian Society of Nephrology will be held in the many halls of the main Slovenian cultural and congress centre – the Cankarjev dom, which is located in the heart of Slovenia’s capital. Kidney failure, or also called end-stage renal disease, is the last stage of chronic kidney disease. And when the kidneys fail, a person can only survive with the help of dialysis or a kidney transplant. And since the latter is not that common for there are not enough kidneys for all the patients with kidney failure, the dialysis is necessary. This is where the peritoneal dialysis (PD) comes in. PD is a treatment for kidney failure that uses the lining of a patient’s abdomen, or belly, to filter a patient’s blood inside her or his body. The benefits of peritoneal dialysis compared with commonly more known hemodialysis can include greater lifestyle flexibility and independence, more flexible dietary guidelines, more stable blood chemistry and body hydration, and longer lasting residual kidney function. Obviously, the PD is a very important medical treatment and the purpose of International Society of Peritoneal Dialysis (ISPD) is to advance knowledge of PD and to and to promote the advancement of such knowledge through international scientific meetings and scientific publications. One of such meetings is the EuroPD, the three-day meeting with a rich scientific programme. Experts from Austria, Belgium, Canada, Cuba, Denmark, France, Germany, Italy, Netherlands, Poland, Portugal, Slovenia, Sweden, UK, and USA will give lectures and will hold workshops and discussions on latest discoveries, case studies, troubleshooting. The three-day event will also include a symposium and an exhibition of posters. The events will take place in Grand Reception Hall, Foyers, Linhart Hall, Kosovel Hall, and several smaller conference halls. With such an important medical and scientific event being held in its diverse halls, the Cankarjev dom – Cultural and Congress Centre Ljubljana gets another confirmation and recognition as the venue proper for prominent scientific events of a worldwide significance.